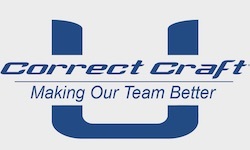 Orlando, FL (January 31, 2019) - Correct Craft, long known for its commitment to exceptional employee development, has launched a new employee educational program, Correct Craft University (CCU). CCU will expand, enhance and elevate the fundamental skills of all levels of team members at Correct Craft and its subsidiaries. Correct Craft University is a voluntary program meant to provide opportunities for personal, professional and leadership enhancement. The personal growth sector will focus on financial management skills, language and computer classes. Professional growth will focus on-the-job training skills. CCU will also offer a leadership course based on job responsibilities that reinforce current skills and prepare those individuals who aspire to be in a leadership position with the skills they need to advance. CCU tailors its courses specifically to each Correct Craft brand. Education and development occur in several formats – on-site training classes, individual micro-learning videos, webinars, and assigned readings. A book-club and cross-functional team meetings will be facilitated at each company to integrate staff and build individual acumen and team comradery. Employees’ completing the program are eligible to apply for promotional opportunities within the entire Correct Craft organization.